It is hard to imagine that a 20th century illustrator who produced hundreds of paperback covers and an almost equal amount of advertising art could fall into relative obscurity so quickly. 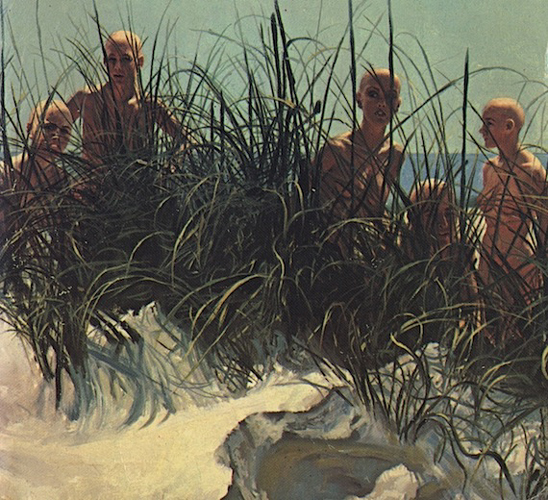 Yet that is the unfortunate legacy of Victor Livoti, a supremely talented realist painter who passed away in 2009 with barely a hint of the kind of fanfare he deserved for being one of the most prolific practitioners in illustration. Livoti's lack of public recognition is partly of his own accord. He never signed his paintings or exhibited them, and even his date of birth had been kept a secret until his obituary was posted (b.1923). However, what should not be left to obscurity is his significant and very substantial body of work, which represents some of the most attractive cover art in all of publishing. After serving in the U.S. Army in World War II, Livoti took up studies at the National Academy School and at the Art Students League in New York City. He then worked in advertising and in the 1960s he began producing illustrated book covers for nearly all of the major paperback houses in the country: Avon, Ballantine, Bantam, Berkley, Charter, Dell, Fawcett, Harlequin, Jove, Pinnacle, Signet, St. Martin's, Warner, and Zebra. Livoti's style, now firmly established, adhered to formal realism, yet was marked by strong contrasts and a full range of values. Livoti was also pioneering the use of montage illustration as beguiling cover art. In addition, his art began boosting some of the biggest names in novel writing, such as Desmond Bagley, Barbara Taylor Bradford, James Carroll, Leslie Charteris, Len Deighton, John Dunning, Howard Fast, John Fowles, Paul Gallico, Robin Hardy, Burt Hirscheld, Jack Hoffenberg, Victoria Holt, Evan Hunter, John Jakes, James Jones, Frank Kane, Herbert Kastle, Elmore Leonard, Robert Ludlum, Erich Segal, Irwin Shaw, Wilbur Smith, Ross Thomas, and Dan Wakefield. As far as authors go it does not get much better than that, unless you want to add James Baldwin to the list, for whom Livoti also provided cover art. 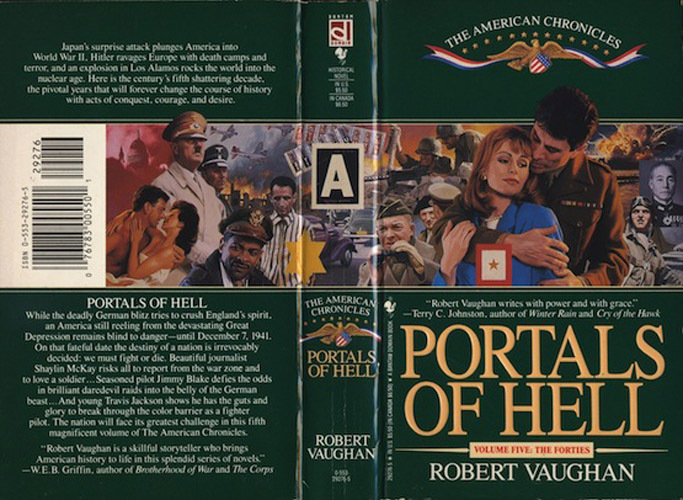 I have posted a loose chronology of Victor Livoti's cover art below, tracing his amazing career path to its culmination in the mid-1990s. A mini-biography of each author is also included. Maid in Paris and Nurse Nolan's Private Duty are the earliest paperbacks with Livoti's cover art that I have been able to obtain. Both books were published by Dell in 1966. Frank Kane (1912-1968) wrote twenty-nine novels featuring his private investigator, Johnny Liddell. 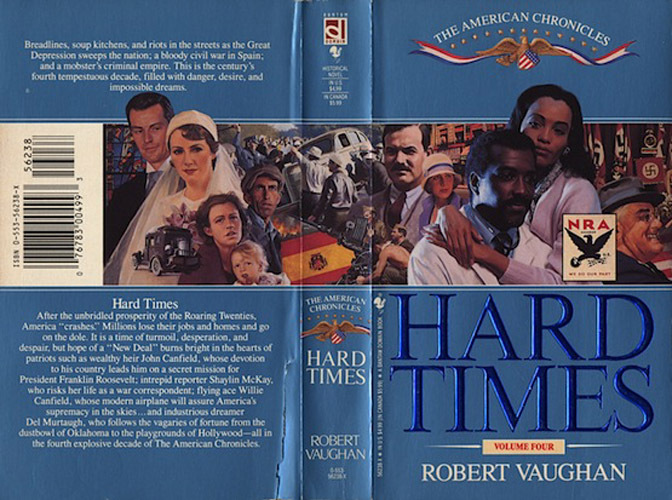 The books proved to be so popular that even CBS approached him about adapting his character into a television series. The proposal did not work out, although he soon began writing scripts for other television series such as The Investigators, Mike Hammer, and Special Agent 7. Before television Livoti worked in radio, writing scripts for The Shadow, Gang Busters, Call the Police, and Nick Carter, Master Detective. Kane passed away too soon at only fifty-six years old, but the mark he left on the world of private investigator fiction is indelible. Indiana native Elizabeth Adeline McElfresh (1918-2015) specialized in writing medical novels. She wrote fifty-six of them in all, some under the pseudonyms Jennifer Blair, John Cleveland, Jane Scott, and Elizabeth Wesley. She was a society editor at the Vincennes Sun-Commercial newspaper for more than thirty years before becoming a public relations director at the Good Samaritan Hospital in Vincennes, Indiana. Her hospital work appears to be a case of destiny calling. These are two Livoti covers with matching styles and palettes, both painted in 1967. Livoti would eventually tighten up his style to appear even more photo-realistic, but there is certainly no discounting the exceptional quality of these earlier works. Derek Marlowe (1938-1996) was an English playwright, screenwriter, painter, and novelist, with nine novels to his credit. 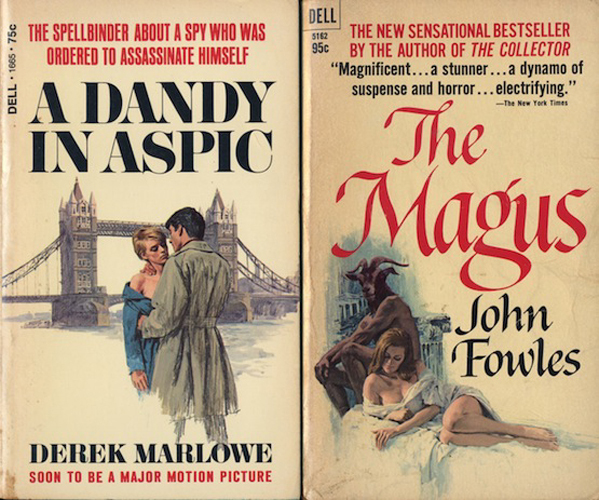 His debut, A Dandy in Aspic (Dell, 1967), was only a modest bestseller at the time, but has now become highly regarded by spy fiction fans. The story was filmed almost immediately upon publication by director Anthony Mann, who died unexpectedly during production. Getting asked to paint the cover of the first U.S. paperback edition of The Magus had to have been a source of pride for Livoti. Dell published their edition of John Fowles's landmark novel in January 1967. It was then reprinted many times with the lovely lady-in-repose before Fowles revised his text and the book was given a new look by British artist Tom Adams. 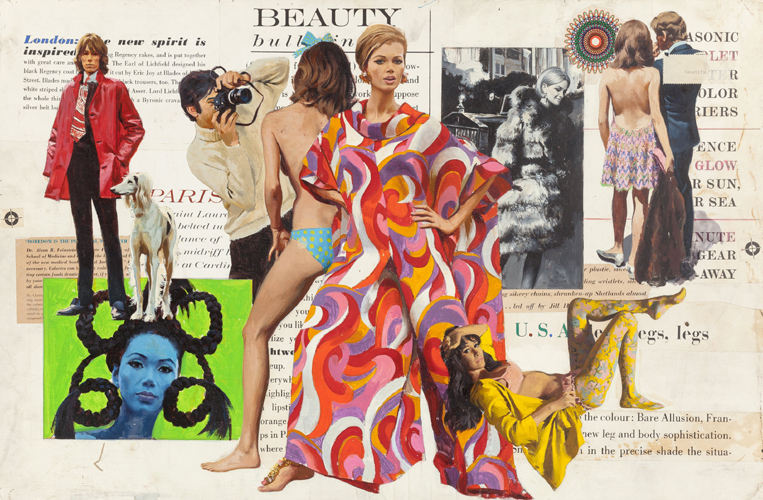 One of Livoti's first montage illustrations, this work is a brilliant mashup of the fashion industry, produced for the cover of Dell's paperback edition of The Beautiful People, written by New York Times reporter Marilyn Bender. Note the omission of the clippings from the final cover product. Dell published their edition in 1968 after Bender's non-fiction book had already become a pop sensation in hardcover. 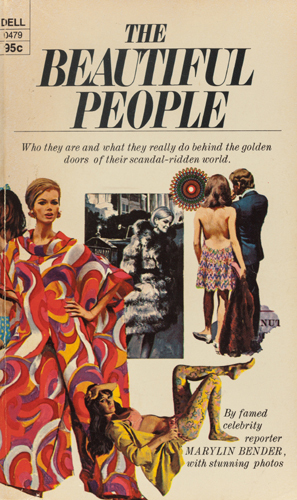 The hardcover was subtitled, “A candid examination of a cultural phenomenon—the marriage of fashion and society in the 60s.” Dell's tagline pushed the limits of exaggeration by proclaiming, “Who they are and what they really do behind the golden doors of their scandal-ridden world.” It is a not-entirely-inaccurate description, as it were, but what it reflects mostly is the kind of aggressive marketing strategy that paperback publishers engaged in routinely. 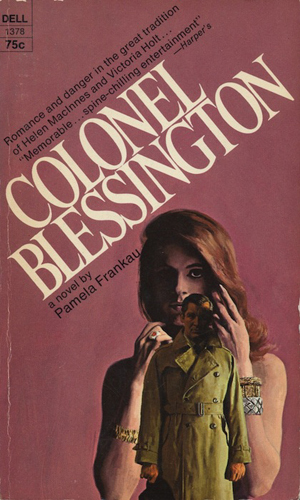 Designer/artist Paul Bacon produced the dustjacket art on the hardcover edition of Colonel Blessington (1968). 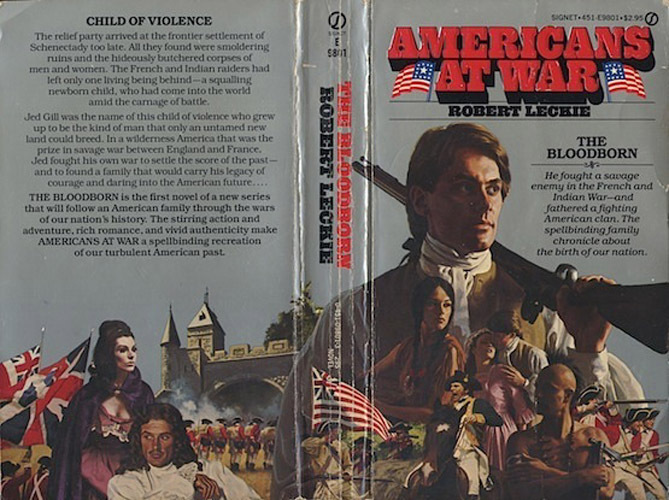 Although it certainly has a lion's share of admirers, I prefer Livoti's oddly juxtaposed illustration on Dell's 1970 paperback version. Pamela Frankau (1908-1967) wrote more than thirty novels in her all too brief lifetime—her first when she was just nineteen-years-old. She also wrote dozens of short stories, articles, and plays for both stage and radio, and even penned her own autobiography when she was still in her twenties. Colonel Blessington was the last thing she ever wrote. The novel was published posthumously with the help of Frankau's cousin, Diana Raymond, who had to merge eleven manuscripts together to form a publishable whole. An audio tape recording made by Frankau, along with notes taken from hours of talks, also contributed to Raymond's eventual success. The end result reads like modern day Shakespeare, though swift and suspenseful, and themed by obsessive relationships, enigmas, riddles, disguises, and flavorful gothic trappings. The reader must suspend their disbelief through the story, but the clues to the shocking denouement are all there—even from the beginning. Brian Glanville's The Olympian (Dell, 1970) and Peter Kortner's Jim For Sale (Dell, 1973) both share the same pair of models, even though there is a three year gap between each book. I wonder if Livoti was able to paint these back to back, or years apart as each deadline approached? Before becoming a novelist, Peter Kortner (1935-1991) worked in television as a producer, story editor, and writer, with credits on Playhouse 90, Studio One, The DuPont Show of the Week, General Electric Theater, Hazel, and The Farmer's Daughter. His Austrian father, Fritz Kortner, and his German mother, Johanna Hofer, were both distinguished actors, and have one hundred and forty-seven film credits between them. 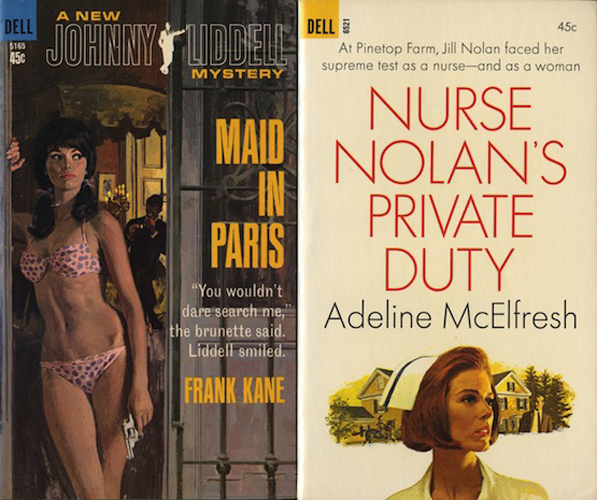 From 1969 to 1973 Livoti produced seven paperback covers for Avon's popular novelist Jack Hoffenberg. 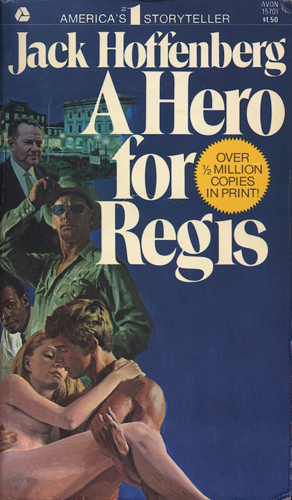 Like A Hero for Regis, each book has a descending montage situated on the left side of the cover. In essence, they are prototypes of what eventually would become Livoti's predominate illustration template—the wraparound montage. Jack Hoffenberg was born in 1906 and attended the University of Maryland and the Maryland Institute College of Art, where he learned to sculpt under famed sculptor Reuben Kramer. After serving in World War II as a major, Hoffenberg opened up his own successful advertising agency in Baltimore. In the 1950s he relocated to Southern California and it was there at age fifty-three that he began to write fiction. He completed ten novels, each one epic in length and meticulously researched for period accuracy, before being struck down by an unfortunate illness in 1977. 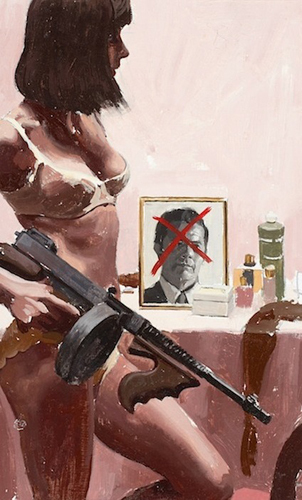 At first glance it appears that this copy of Hit Woman has been marked up by a red crayon, but a closer look at Livoti's cover art reveals otherwise—note the red lipstick lying on the table. In the preliminary painting, oil on board at approximately 12 x 17 inches, the lipstick has yet to be added. 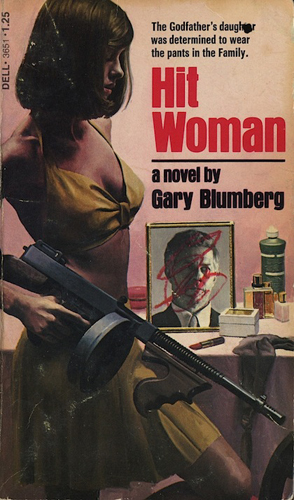 Gary Blumberg's Hit Woman was published by Dell in 1975. 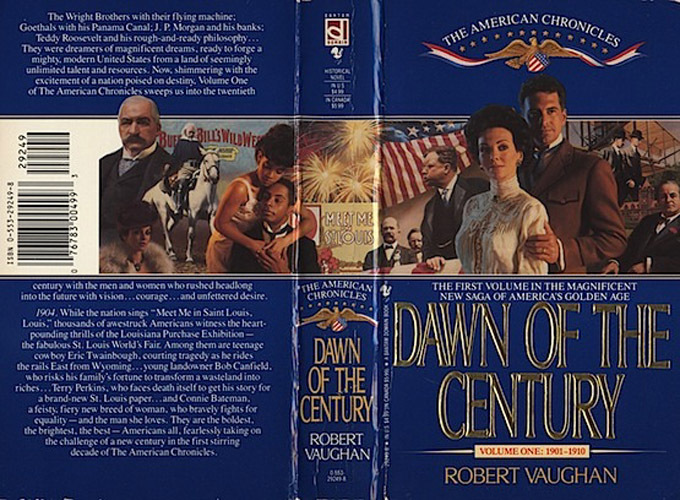 The tagline on the back reads, “The novel that drags The Godfather kicking and screaming into the 1970s.” Blumberg also wrote Adrano For Hire, a series of men's adventure novels, under the pseudonym Michael Bradley. In collaboration with his friend and fellow journalist Morris Cargill, John Edgar Colwell Hearne (1926-1994), a Canadian-born, Jamaican-educated journalist, wrote three thrillers about an imaginary Jamaican secret service agency. 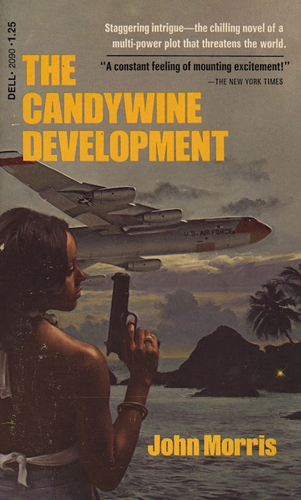 They were all published under the pen-name, John Morris, but Livoti's cover art with its B-52 Bomber and gun-toting beauty only emboldened the second book in the series, The Candywine Development, which Dell published in 1974 following the 1971 Citadel Press hardcover edition. 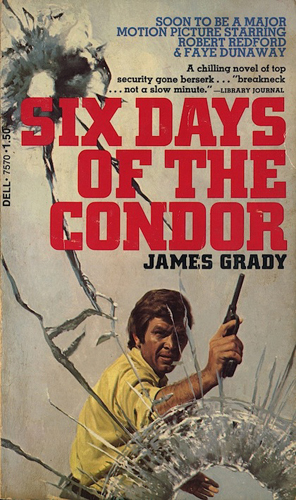 James Grady (b.1949) has written sixteen novels to date—four of them thrillers in his bestselling espionage series, The Condor. 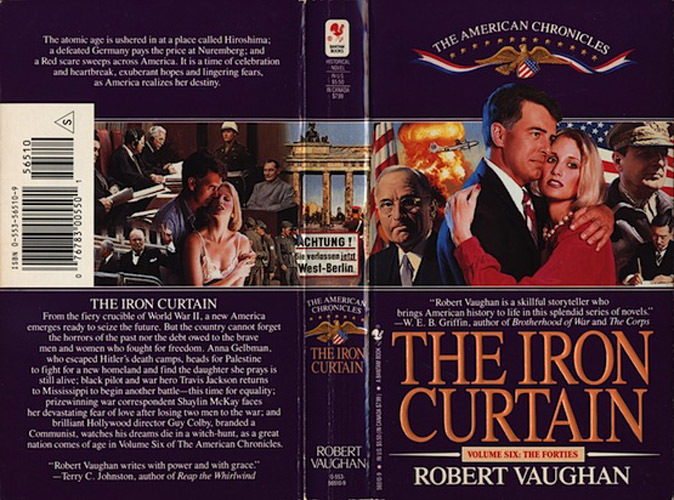 His first book, Six Days of the Condor (Dell, 1975), was filmed as Three Days of the Condor. Though the film varies from the book in several aspects, both versions are great in their own way. One highlight in the film is the fight scene between Robert Redford and Hank Garrett (of Car 54 fame) in Faye Dunaway's apartment; it is exciting and realistic. The highlight of the paperback edition is Livoti's “bullet holes in the window” cover art. 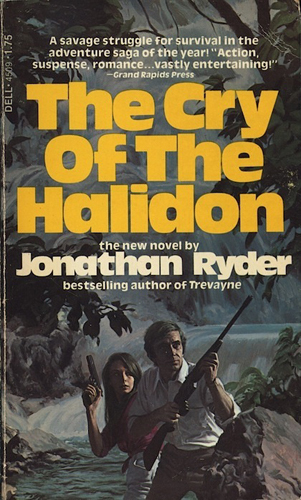 Livoti's scene-specific illustration on the cover of The Cry of the Halidon (Dell, 1975) makes the viewer want to read the novel in order to find out just how this handsome couple ended up alongside the banks of a pouring river, armed for bear. Robert Ludlum (1927-2001) used the pseudonym, Jonathan Ryder, only twice in his career. Under his own byline he wrote twenty-five novels; it is estimated that there may be as many as four hundred million copies of his books still lying around. Ludlum also wrote the bestselling Jason Bourne spy series, which to date has spawned four successful films. Those films and the use of his name on books written by others have helped his estate build an estimated one billion dollars in net worth. 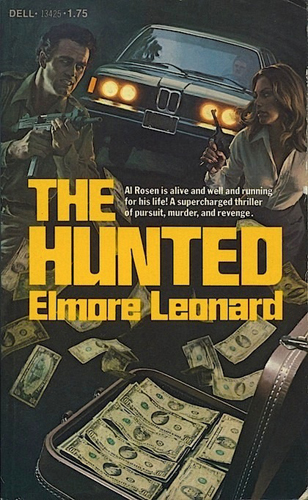 Livoti produced several covers for novelist Elmore Leonard (1925-2013), including this moneyed one for The Hunted, which Dell published in 1977. In the 1980s I attended an Elmore Leonard book signing at the Tattered Cover bookstore in Denver. The Edgar Award winner spoke openly about his personal writing philosophies, which at the time were undocumented. In 2001 he made them officially known in a New York Times essay titled, Ten Rules for Good Writing, which became the basis of a very slim, overpriced, handsomely illustrated book in 2007. 4. Never use an adverb to modify the verb “said”... he admonished gravely. 5. Keep your exclamation points under control. You are allowed no more than two or three per one hundred thousand words of prose. 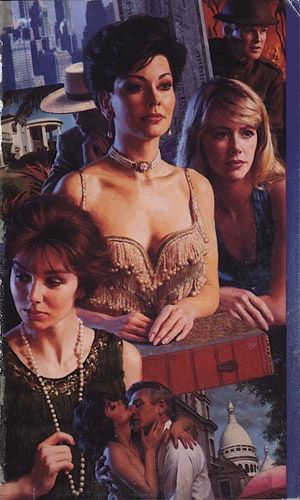 Patricia Colbert Robinson and Nancy Stevenson wrote three mystery novels together. 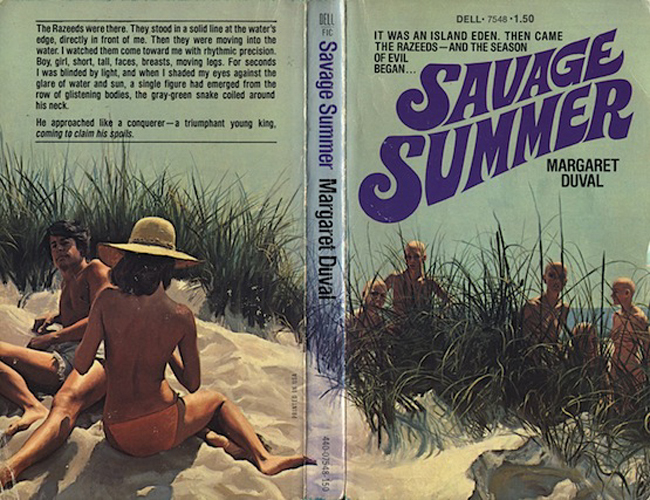 On one of them, Savage Summer, they used the pen-name, Margaret Duval. 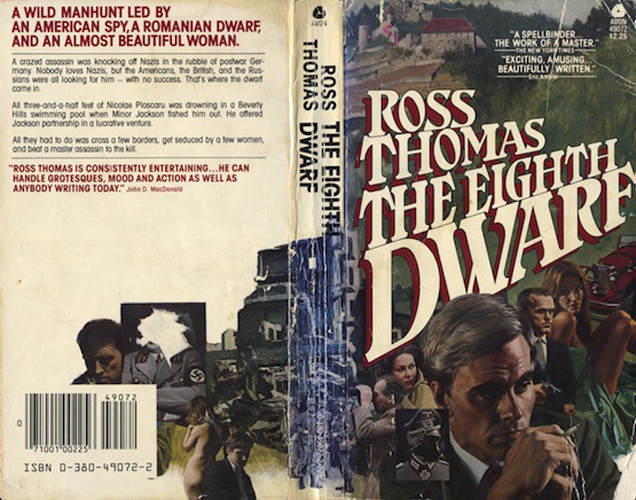 Livoti provided the cover art for the 1976 Dell paperback edition, a rather fine fit for the story's rather strange, sexually charged atmosphere. And no, those are not manikins posed behind the dune! Patricia Robinson (1929-2001) was a distinguished Charleston, South Carolina, author, poet, actress, and playwright, with over fifteen plays to her credit. Of her seven novels, which were mostly mysteries, four were written unaccompanied, and all are set in or around her beloved hometown of Charleston. Ferdinan B. “Nancy” Stevenson (1922-1998) was the first woman to hold statewide elected office in South Carolina, as Lieutenant Governor from 1979 to 1983. She campaigned under the slogan, “not one of the good old boys!” In office she became an advocate for accountability and helped initiate a toll-free hotline for citizens to contact state agencies. Her political career was nearly derailed when it was learned that she had co-written a lurid novel about island vacationers being manipulated by a ritualistic, bald-headed tribe of weirdos. The novel of course was Savage Summer. Her opponent, State Representative Horace Smith, tried to raise questions about her supposed lack of morals because the novel contained sexual material and references to certain South Carolinians as “culture-starved rednecks” and “tater-popin', egg-suckin' rednecks.” Mrs. Stevenson won election by 176,867 votes to Mr. Smith's 154,396. Apparently, South Carolinians like their novels just as racy as the rest of us. Milton Lesser (1928-2008) wrote an incredible amount of science fiction under his own name and various pseudonyms before legally adopting the name Stephen Marlowe. 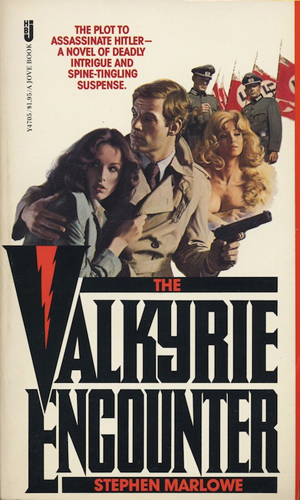 His best books were written as Marlowe, including the World War II thriller, The Valkyrie Encounter (Jove, 1978), and a slew of novels starring his globe-trekking private investigator, Chester Drumm. Those early Drumm novels, published mostly as Gold Medal originals, had cover art supplied by famed artists Ernest Darcy Chiriaka, Robert McGinnis, Barye Phillips, and Stanley Zuckerberg. We can now safely add Victor Livoti to that very distinguished list. 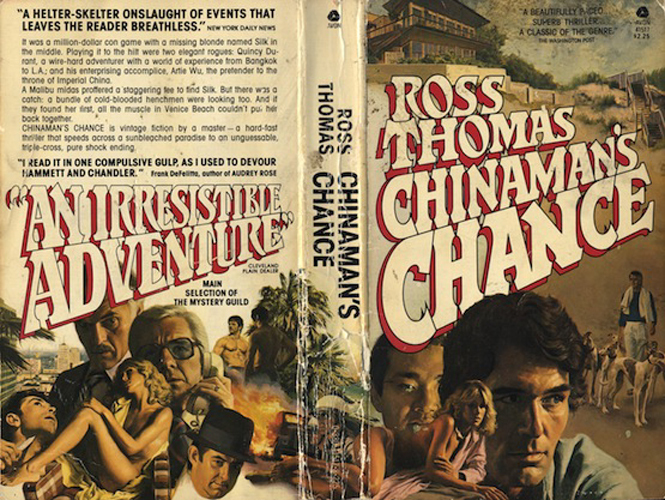 If you've never read anything written by the Edgar Award-winning author Ross Thomas, you should; these two novels, Chinaman's Chance (Avon, 1979), and The Eighth Dwarf (Avon, 1980), are as good a place to start as any. Although, you may run across, The Fools In Town Are On Our Side (1970), which some argue is Thomas's best novel. 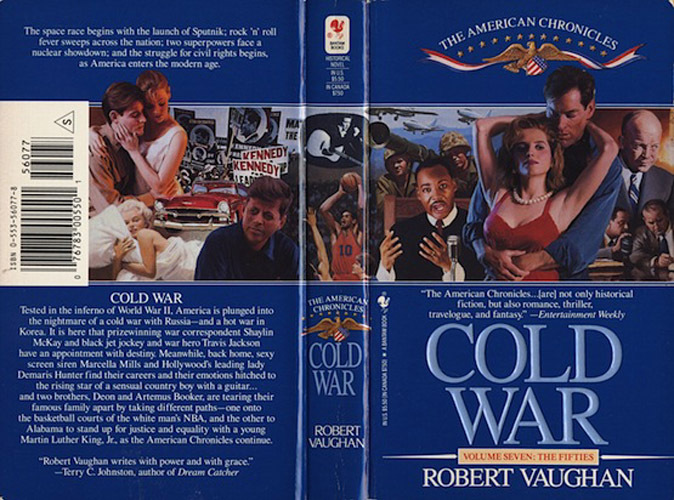 That paperback, also from Avon, has a great cover illustration by Norm Eastman, but Livoti's wraparound montages here are just as great. This is one of my favorite illustrations by Livoti, a gem of a montage on a paperback that I have managed to keep in fine condition for thirty-six years. 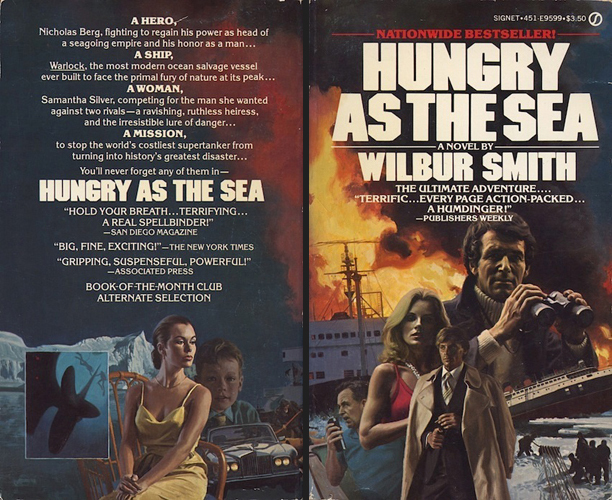 Even though I have devised a method of pressing down the covers of a paperback on my scanner to capture the full image of its wraparound art, I was not willing to do that to my copy of Hungry As The Sea (Signet, 1981) because it invariably weakens the hinges, hence the decision to post separate images of its covers instead. Wilbur Smith rarely needs an introduction—even casual readers seem to know his name and brand. Born in 1933 in Northern Rhodesia (now Zambia), Smith was raised on his family's African cattle ranch. His tough, hardworking father didn't approve of books as entertainment, though his mother did. She helped instill in her son a passion for literature. Smith's English Master at boarding school was also a key motivator for the boy. Their combined influence resulted in Smith writing thirty-eight bestselling novels including Hungry As The Sea, a terrific maritime adventure centered in America and the Antarctic. 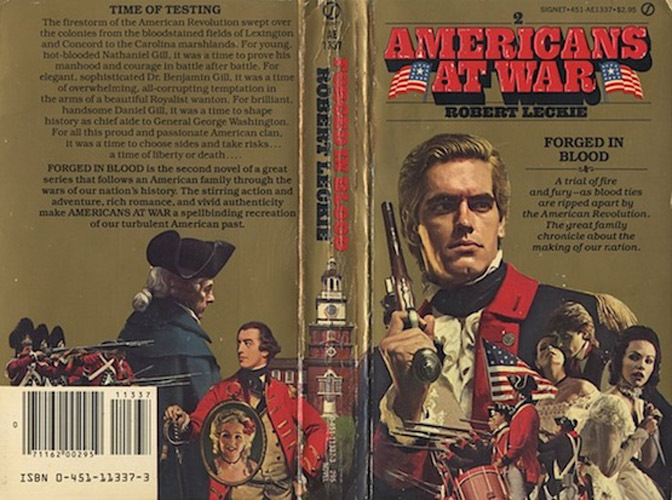 Robert Leckie (1920-2001) wrote more than forty non-fiction books on United States military history, spanning from the French and Indian War to Desert Storm. His 1957 memoir, Helmet For My Pillow, formed the basis of the 2010 HBO series, The Pacific. He also wrote five historical novels, among them The Bloodborn (Signet, 1981) and its companion Forged in Blood (Signet, 1982). Livoti's wraparound montages appear to be relatively accurate in their period detail, which no doubt pleased the stickler Leckie. How can anyone resist these peepers? Certainly not me. I bought this very copy with Livoti's enticing cover portrait as soon as saw it in a used bookstore. Had I known about it when it was first published, I would have an even better copy preserved for posterity. 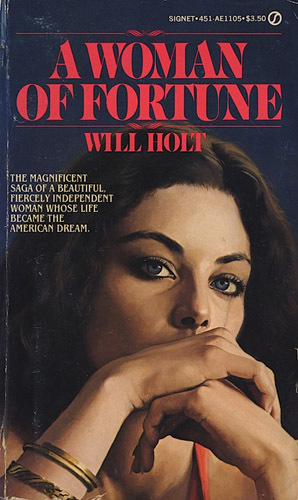 Will Holt (1929-2015) wrote only one other novel besides A Woman Of Fortune (Signet, 1981)—the storm-ravaged melodrama, Savage Snow (1980). He worked primarily as a musical playwright but he was also an accomplished singer/songwriter and a key figure in the American Folk Music scene of the 1950s and '60s. The hit songs Lemon Tree and Raspberries, Strawberries were both his, though they were championed by other performers, including The Kingston Trio; Peter, Paul and Mary; and The Seekers. Holt's son Courtney has said that his father's music influenced many people, “Dad always worked behind the scenes inspiring other people, which I think is really cool.” It looks like Will Holt inspired Victor Livoti, too. 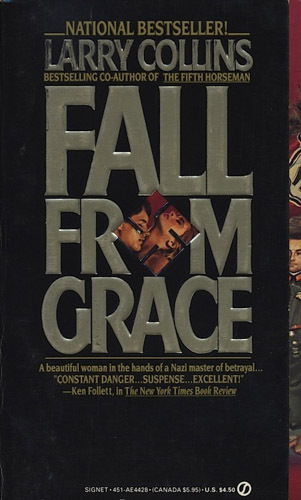 Larry Collins's spy novel, Fall From Grace (Signet, 1986), is a tough book to recommend, even though I consider it a real page turner. The story takes place in 1944 and follows a courageous young Englishwoman and a French resistance fighter who become embroiled in a complicated plot to deceive Germany into believing that the D-Day invasion will take place at Calais instead of Normandy. In reality, they are merely pawns in a dangerous game of deceit involving both British Intelligence and the Gestapo. Of course, it all ends badly, contradicting my belief that our heroes would somehow, in some way, persevere. Livoti's stepback montage did manage to lift my spirits, though, and for that I am grateful. Larry Collins (1929-2005) was a Yale graduate who co-authored four books with French writer Dominique Lapierre. Their first was the famous book, Is Paris Burning?, which was made into a film in 1966. Fall From Grace was also filmed, but for airing on television. Debuting in 1994, it boasted a strong cast which included, among others, Michael York, James Fox, Richard Anconina, Patsy Kensit, and Tara Fitzgerald. 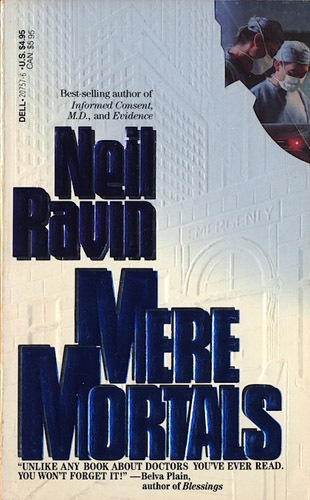 The front corner of Neil Ravin's medical melodrama, Mere Mortals (Dell, 1990), was die cast to conform to the shape of a hospital building. Livoti's stepback illustration can be glimpsed just underneath. Of interest here is the gray-haired fellow near the top, who Livoti repurposed from Chinaman's Chance, though I am certain the rest of the elements are new to this montage. Neil Ravin is an endocrinologist and the author of five novels about hospitals. His books have been mostly well received and some are beloved by readers. 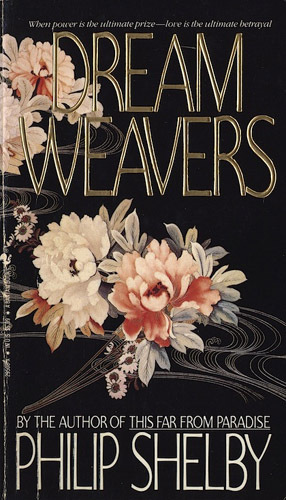 Bantam published Dream Weavers in 1992 in both trade softcover and mass-market paperback formats, though the design for each was identical. The flower drawing is credited to the Japanese publishing entity Kyoto Shoin, Inc., but the beautiful stepback illustration is all Livoti's. Montreal born Philip Shelby (b.1950) wrote nine novels (all family sagas or thrillers) before relocating to California to write screenplays for Hollywood. His film credits now include Survivor (2015), a political thriller starring Pierce Bronson and Milla Jovovich, and Mechanic: Resurrection (2016), a big-budget Jason Statham action-thriller. Retired Army officer Robert Vaughan has been writing books for almost sixty years. He sold his first novel at age nineteen, and his output now exceeds five hundred books. 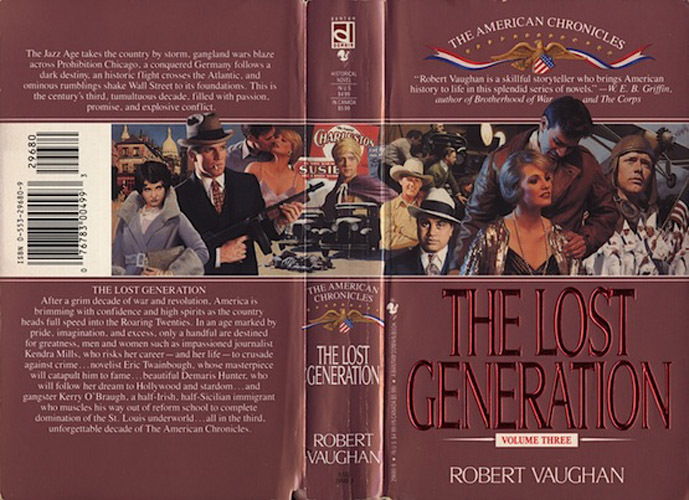 Vaughan writes westerns primarily, but he has also written novels in most every other genre except perhaps fantasy, and under a variety of pseudonyms. 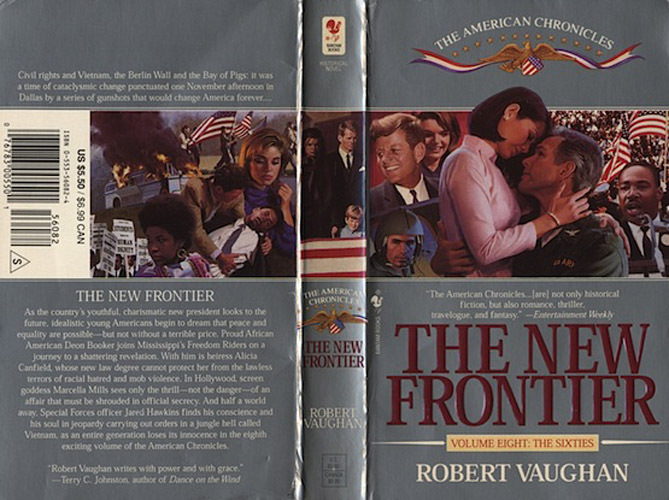 His epic, scholarly, and quite entertaining fiction series, The American Chronicles, with volumes published between 1992 and 1996, may in fact be the last set of actual cover art that Victor Livoti produced before retiring. Oddly enough, Volume One's cover art was erroneously credited to “George Busch,” which may seem like an inside joke since George H.W. Bush was then President of the United States. In Volume Two the spelling was amended to read “George Bush.” Each subsequent volume was properly credited to either “Vic Lavoti” or “Vic Livoti,” so in all honesty I think these gaffes were nothing more than just editorial oversight, of which every publisher is guilty from time to time. The ninth and last book in the series is titled Flower Children and was published in 1996 by Bantam, though the cover art was supplied by Bob Larkin. 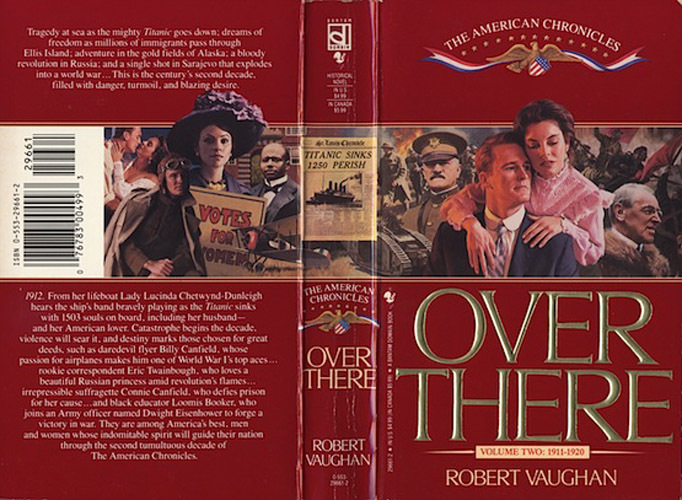 Why Livoti did not provide the cover art is not known, but Larkin certainly met the art director's expectations by replicating the same basic montage composition that was used on all of the previous volumes. I am still searching for paperbacks published after 1995 that have covers by Victor Livoti, but have not found any to date. My goal is to collect his very last cover (which I may already have in V. 8), and of course I am still searching for his first cover, too, which sometimes feels like an arduous if not impossible task. However, the “hunt” is really what makes collecting fun, and it never wanes unless you get reined in by your spouse, or you happen to develop hoarder's remorse.